Why you should be shocked by Tullian’s sin. If you knew what I’d experienced in the last few years, you would think I shouldn’t be surprised by more adultery. Part of me isn’t. I mean, it’s getting tiresome. I am weary of grieving loss. I am fighting cynicism. And losing many days. And yet still when I heard about another pastor falling, my response was shock. What? No!! It can’t be. In fact when I texted my close friends, their response was similar. Shock. Disbelief. Yet so many voices on twitter said I shouldn’t be surprised. 1) We aren’t supposed to be shocked. 2) All sins are the same. 3) We know why this happened. I have a hard time with all three of these conclusions. I understand the sentiment behind them. And there are no stones coming from me. But I had some different thoughts. 1) Sin should be shocking. It is the exact opposite of why we were created. We have eternity engraved on our hearts. And if you have come to the point where the revelation of sin doesn’t cause a reaction in your heart, I would call that callous. Imagine if your friend came to you and told you that she just heard news that a mutual friend, mother of 4 littles was diagnosed with cancer. How would you respond? Would you say “Yeah, cancer. Everyone’s getting that these days. Ya know, we live in a fallen world. I’m not surprised. ” I doubt you would respond that way. I can tell you how I would respond, how I have responded. I would respond the same way I did a week ago when I heard about Tullian resigning for being caught in adultery. Why would I respond that way in either scenario? Is it because I didn’t know it was possible? Certainly not. Sadly I have watched each of those situations play out far too often. But every time shocking. No not them. It’s not supposed to be this way. We were made for more than this. Sure, if they were confessing to me, I would try “not to blink.” But my heart would be screaming, “no, not you!” Maybe because I know all too well the pain that is in store. 2) Not all sin is the same. I have had a friend in both of those situations. So I can tell you that the consequences and the steps to healing are radically and traumatically different. There is no comparison. 3) We rarely know the exact cause. Over a year ago my pastor was caught in adultery. Rumblings echoed throughout the “grace” camp that his sin was a natural result of treating the Bible like a rules book. That’s why he fell. Now that a pastor from the grace side of the spectrum has fallen, they are claiming his theology has nothing to do with it. Mmhmm. Then there are those claiming it was the size of his influence. My question is this, if a small church pastor falls, and no one is there to tweet about it, does his family still suffer? I mean really, until someone can produce one complete study comparing the two, I don’t want to hear it anymore. As if you can even compare the eternal impact, positive or negative, of two different people. Here’s the reality. Sometimes when someone develops cancer, the cause seems clear. When a smoker gets lung cancer, or someone that worships the sun gets skin cancer it is reasonable to connect the cause and affect because science. But other times, in fact most times, the cause is not clear. There are just too many factors in play to blame one factor….. even in seemingly obvious examples. And still,even if the cause does appear clear to you, would the day of discovery be the time to blog about why they got what they deserved? I don’t think so. Sometimes sin is shocking, and yet not all to the same degree, however playing Monday-morning quarterback is only helpful if you are analyzing your own game. I hope more Christians are shocked. I hope that we are so shocked that we make dramatic changes in our own lives. I pray that friends start going the extra mile to share struggles, ask uncomfortable questions, and make praying for each other a priority. I pray that we realize our battle is not against flesh and blood but against powers of darkness. I pray that we would stop shooting our own and understand that the world will know we are Christians by our love for one another. Amen. I think it’s important to note that this is not a commentary on Tullian himself, but it is a response to the *comments* surrounding his choices. And lastly, I don’t think it’s biblical to tell people how they should feel. Be angry and sin not. Sometimes shock and anger is part of the gig. But I daily pray for Tullian and his family and Bob and his family, and the countless other families that have been shocked this year. 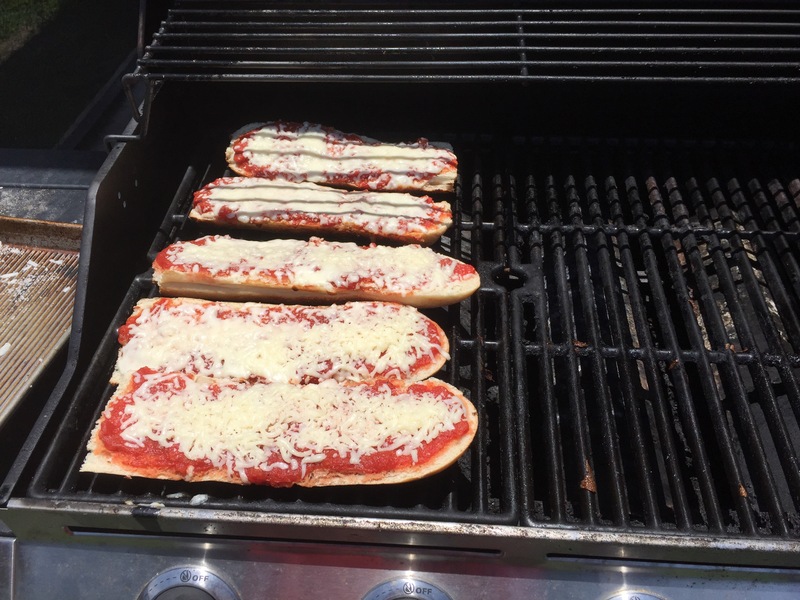 The Trick to the Best Summer Pizza Ever…reallly!! But that is not the issue at hand. The issue is that I keep forgetting that my oven is broken. So I get my heart set on a yummy meal to cook in my oven. Then I assemble said meal, turn the oven on, and ……..nothing! I would like to call it momnesia, and people would believe me. But the truth is remembering important things has never been my forte’. But that is a topic for another day. Now what?? Food depression is real. And I was feeling it. I love cooking and eating. I love being the mom because I get to eat whatever I want to make, and I really wanted french bread pizza. Not having pizza was just never an option. We have great neighbors, so I asked if we could cook our pizza in their oven, but then the heavens opened up and I heard a voice from on high say. And it was hands down the best pizza I may have ever eaten! The bottom was crispy and delish and the cheese, sauce and inside bread were just an amazing gooey combination of yum. I consider Archimedes a kindred spirit. I tend to hyper focus on one thing to the demise of everything else around me. So here ya go. This is one of those cooking “Eureka” moments. Because I have found it! I might never use the oven again for french bread pizza. This was a banner day! It’s pizza. So the recipe goes like this: bread, sauce, and cheese. We don’t really need measurements here do we? You can use jar sauce. Personally, we just take a can of crushed tomatoes and add a 1 tsp (or so) each of garlic salt, salt, sugar, pepper. I don’t know. My twelve year old does it. Just add to taste. But here is the important part. Preheat BBQ and then keep it at a low to medium temp. You don’t want to burn the bottom before the cheese melts. I have faith in you. Another tricky part for me was removing them. The french bread wanted to flip right off my spatula! I burned my finger. You have been warned. When the cheese melts, voila! You are done! Timing depends on the heat of the BBQ (remember low to medium) so just keep an eye out the first time. Crispy yet gooey goodness! And you won’t heat up your house! Woman killed by lion made the same mistake you have made nearly every day. When I heard about the woman that had been attacked in her car at Johannesburg Lion Park, I immediately wondered how this could happen. I wondered if they would lose business with such a tragic loss. Aren’t they supposed to keep their patrons safe? The park owner was not at fault. The deceased woman made a tragic mistake. She had her window all the way down. Despite many signs and rules that warned her not to do just that. So this is where most people breathe a sigh of relief. Oh, ok. I would never do that. I am safe. Isn’t that what we do when we hear horrible news? How did they die? A car accident? ok, well I am a good driver. I am ok.
How did their child die? Oh, they drowned? My kids can swim. I am ok. He lost his job? Why? Oh, I am in a good field. I am ok. They got divorced? Why? Oh, I have a good marriage. I am ok.
We assess our risk. And relax. But before you do that here, let me ask you to reconsider. You see there is a greater risk to you than even losing your own life. It is more dangerous, and yet more common. You could lose your soul. And the prevention measures are so similar. Let’s imagine for a minute, what this poor woman was thinking. What would you tell her? Or better yet, what if you were in a car with a friend tomorrow, at this same park, near another lion. What words of caution would you give? And we are getting eaten alive. We are. The church. We have erased the lines. No more rules. No one becomes like Jesus because of rules, right? Watch movies that glorify every sin under the sun, listen to music that seeks to destroy the image of our God, wear clothes designed to elicit lust. After all, rules and God’s laws are so 1980’s. We can do it all! Because we are free in Christ, right? However, in this quest to run from legalism, we have made a huge mistake. We have opened the window to our enemy the lion standing right there waiting to see whom he may devour. I hope you hear my heart. I am not making light of this story in the slightest. This story is devastatingly tragic, yet it was avoidable. Many of us are also living through tragic yet avoidable stories, all because someone decided to open the window. Someone thought, “I will be different. Those rules don’t apply to me.” But the ending is always the same. There are many that suffer great pain. Many that shake their head and ask why. No one escapes unscathed. I pray for this woman’s family. I cannot imagine the pain they are feeling. I pray for all that are out there today, living with the pain of other people’s bad choices. And I pray for you, if you are looking at that window, tempted to believe that you will be different, that you can break the “Owner’s” rules to find what you perceive to be true happiness. I pray that you would flee temptation. That you would run to the heart of God. That you would trust His Word, and walk in obedience to it. Even……. when you do not feel like it. Keep the window closed!